Earn up to 10,792 reward points. It's like having two amps in one portable 1x15 combo. Taking the OB1-300’s bi-amp inspired, all analogue design as a base, the combo version really shows off the OB1’s deceptive versatility. Despite its relatively sparse layout, the real beauty of this combo is its ability to go from sophisticated to unhinged at the turn of a knob, or the stomp of a foot. The OB1-300 Combo houses a new 15” Eminence neodymium speaker in a carefully designed front-ported cabinet, and this configuration is the ideal match for the OB1’s fearsome tonal platform. The two elements combine to offer an immediate attack and a seriously punchy low end, dishing out warm contemporary cleans, grinding vintage grit right up to heavily distorted mayhem . Most importantly, the OB1-300 Combo remains focused at all extremes of its wide-ranging tone controls—perfect for the bedroom, the bar or the big stage. For years bassists have been combining guitar and bass amps to remarkable effect, adding harmonics and layers of overdrive from a guitar amp to their core bass tone in pursuit of the ultimate live sound. 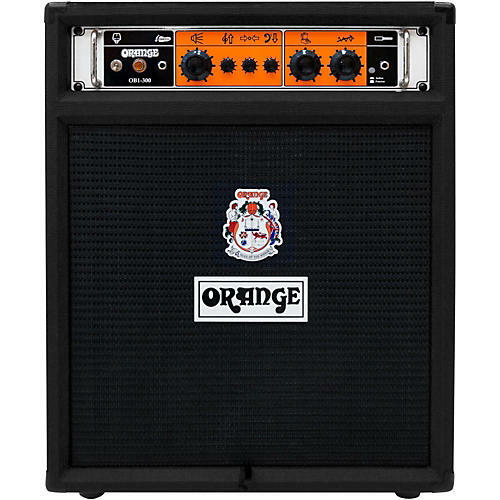 This "bi-amp" trend got Orange thinking, why drag two amps to the show when you could take just one? The key to the OB1’s unique sound is its footswitchable Blend circuit, which adds a veneer of controllable gain and increased harmonic content to the upper registers of the input signal. The lower frequencies and clean signal are left alone, staying warm and clear just as they would be in a bi-amped setup. Depending on where the Gain and Blend controls are set, the possibilities are limitless. Kick in the Blend control to achieve anything from a transparent clean boost, to all-out filthy grind, and everywhere in between. Dimensions: 21.65 in. x 26.77 in. x 13.77 in.